If you haven’t already jumped on board the baker’s twine train, you should. Baker’s twine is great for a variety of purposes– wrapping gifts, crafting, scrapbooking…the list goes on and on. 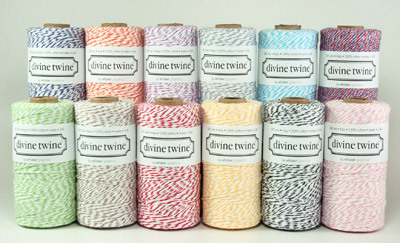 I love the variety of of colors from DIVINE TWINE. Available in singles or sets (The Sweet Dozen, shown above) you’ll find all the twine your heart desires.